Kimberly: All of us are parent leaders in Washington State. We’re “veteran parents”—parents who are veterans of the child welfare system. I got involved 8 years ago. CPS had taken my daughter. When I got her back, they asked me to get involved in implementing the first Parent-to-Parent program. Now I’m a social worker at the Office of Public Defense (OPD), helping parents advocate for the services they need to get their kids back. Alise: I also work for OPD and I’m the parent engagement coordinator for Catalyst for Kids, a division of the Children’s Home Society of Washington. I coordinate the work of veteran parents in systems change and advocacy across the state. Heather: I am the Parents-for-Parents coordinator in Spokane County and an advocate at the Parent-Child Assistance Program, which supports mothers who drink or use drugs during pregnancy. Ambrosia: I’m a volunteer at Parents-for-Parents in Spokane and the facilitator of the Washington State Parent Advocate Network. 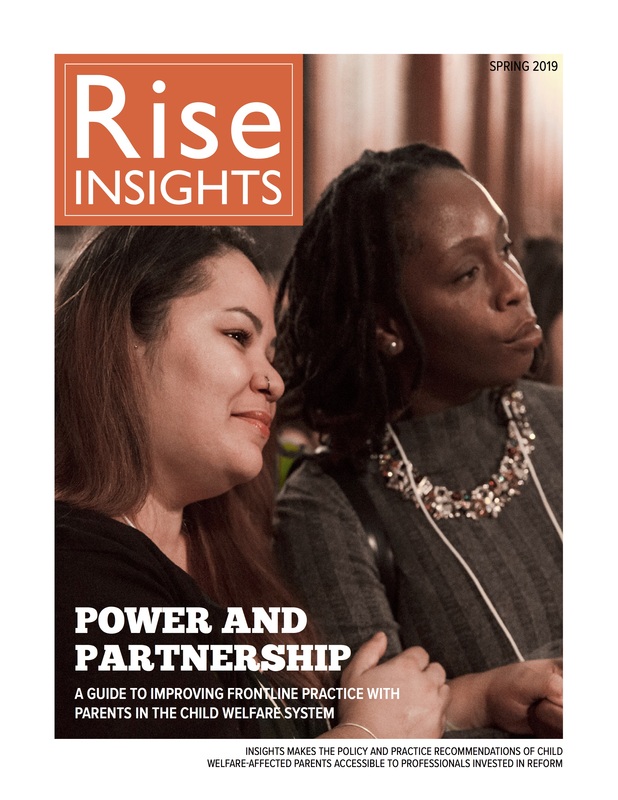 Kimberly: When I came across Rise, I just started printing the issues off the website. My bosses hated it—I would make so many copies! But it was so valuable. We’ve been using it ever since. I could relate to every story. The experiences are universal, and the message is that you are not alone. Rise is solution oriented and it gives people hope. Yes, it’s a tragic situation when your kids come into foster care, but there are steps you can take. I feel a sense of camaraderie reading Rise. We need examples of success. Alise: We have incorporated Rise into Dependency 101, our class to help parents successfully navigate the child welfare system. Every parent in the class receives Rise magazine. We highlight the importance of knowing that you’re not alone in this journey, that parents’ voice in reform is valuable, and that we can have a positive impact on the system. They see that parents like us are facilitating the class and, in Rise, there’s all these amazing parents from across the nation that have succeeded. If we can do it, they can do it too. Ambrosia: When Heather and I learned about Rise, we instantly started looking through all of the issues. We teach a HOPE class in Spokane and put a Rise issue in the packet for parents to take home. Our area is heavily White and heavily addicted. More than 70% of cases have a substance abuse allegation. So we first included in the addiction issue. Then Rise came out with the issue on making the most of visits. We hammer home that visits are on of the most important things to do—no matter how hard it is—to keep the bond with your kiddo. Heather: We’ve been really diving in to Brene Brown’s work on shame and reflecting on parents’ experiences of shame in the child welfare system—how we spin out of control when we’re experiencing shame, how that’s triggered, what our behaviors look like when we’re in a shame storm, and what can do to build resiliency. So many parents come from a place of shame. It’s not, “I made a mistake,” but, “I am the mistake, I am worthless, I am unable to do anything different, this is who I am.” When the system comes in, so often it reaffirms everything you’re afraid of. Alise: I was able to write a story for the most recent issue of Rise, in partnership with another mom, Shrounda Selivanoff. Our story on racial disproportionality has really helped us shine light on this sensitive issue. That article was sent out on listservs to everyone in Washington State who works in child welfare. I got a flood of emails saying, “This is so great.” Most important, it really helped Washington State rejuvenate stakeholders. In child welfare, agencies don’t have all the money they need to do a good job. An issue like racial disproportionality can fall to the background. We need reminders that it’s still a problem and that families and children’s lives are at stake.